☆	Feature: 1.This machine is specialized in auto stator coil//separator inserting process. 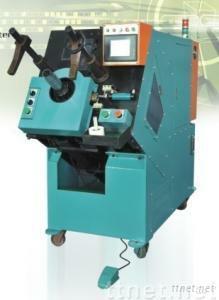 2.This machine is small size with durable machine structures. 3.Easy to change fixture, it only takes about 10~15 minutes. ☆Specifications: 1.Stator inner dia. : 30~100mm 2.Stator thickness: 10~90mm (Price taking by products) 3.length: 150mm 4.System: Hydraulic system with PLC control 5.Motor: AC motor 3.7KW 6.Power supply: 220/380V 50/60HZ/3Phase 7.Machine volume: 1620x700x1600 mm(LxWxH) 8.Machine weight: 1300kgs.